Successfully Added Android Car DVD Player - Dual-DIN, 7 Inch, 3G&4G Support, Android 8.0.1, Region Free DVD, Quad-Core CPU, GPS to your Shopping Cart. With this two DIN Android car DVD player for the Ssangyong Korando, you’ll be able to entertain all your passengers on the road – guaranteeing that there’ll never be a single moment of boredom in your car again. Its large 7 Inch HD display portraits all media in HD resolution, providing great in-car entertainment in stunning detail. Running on an Android 8.0.1 operating system, this Android Car Media Player lets you watch movies, play games, and even browse the web while on the go. Supporting a 3G dongle, you can be assured that this Android entertainment system always keeps you connected to the web – letting you access the Play Store and download your favorite entertainment no matter where you’re at. Besides its entertainment features, this Dual-DIN car DVD player supports a highly accurate 20 channel GPS feature. With this built-in navigation system, you can be assured that you’ll never get lost again and reach your upcoming holiday destinations in the fastest and most efficient way possible. No matter where you’re headed next, simply use Android maps to install the needed area map and you’ll always stay up to date about the real-time traffic information along your route. Supporting CAN BUS, all the features offered by this Android media player can be easily controlled via your steering wheel. Pause movies, change songs, and switch in between its different features – all can be managed with the simple touch of a button. Running on a sophisticated Quad-Core CPU, this two DIN car DVD player is capable of handling mobiles games, movies, and applications without dropping a frame. A region free DVD drive lets you play all your favorite movies, no matter where in the world you’re located. Bluetooth connectivity furthermore allows you to listen to all the tracks saved in your smartphone music library and regular AM / FM radio functions guarantee that you can always enjoy the latest songs and talk shows while on the move. 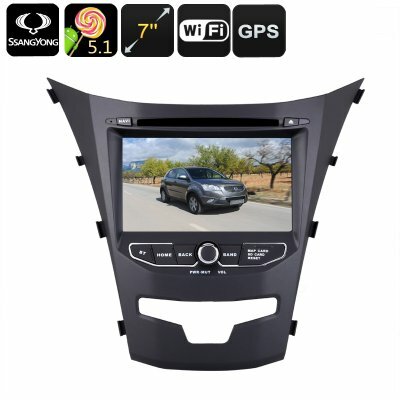 Whether you use it for navigation, in-car entertainment for your passengers, or simply to listen to your favorite songs - this Android car DVD player is guaranteed to meet all your on-the-road demands. From now on you’ll never get lost again and not a single moment of boredom will be experienced in your car – guaranteeing the ultimate road-trip experience. Arabic: - مشغل دي في دي السيارة الروبوت - Chinese Simplified: - 安卓车载 DVD 播放器 - Czech: - Android auto DVD přehrávač - Danish: - Android bil DVD-afspiller - Dutch: - Android auto-DVD-speler - French: - Lecteur DVD de voiture Android - German: - Android Auto DVD-Player - Hebrew: - נגן DVD לרכב אנדרואיד - Hindi: - एंड्रॉयड कार डीवीडी प्लेयर - Italian: - Lettore DVD dell'automobile di androide - Japanese: - Android の車の DVD プレイヤー - Korean: - 안 드 로이드 자동차 DVD 플레이어 - Malay: - Pemain DVD kereta Android - Norwegian Bokmål: - Android bil DVD-spiller - Romanian: - Android auto DVD Player - Russian: - Android автомобильный DVD-плеер - Spanish: - Android reproductor de DVD - Thai: - รถหุ่นยนต์ - Turkish: - Android araba DVD oynatıcı - Vietnamese: - Android xe máy DVD.